Question: "Is there a way to take the blade distributions and work them in Excel?" Yes, the Blade Distributions table functions similarly to Excel and supports copy and paste using the keyboard shortcuts (CTRL+C and CTRL+V respectively). It is best to expand the table using the Expand/Collapse table button (indicated with the red arrow in the attached screenshot), and then selecting the rows by highlighting. To retrieve the data from PropCad to the clipboard, select multiple cells in PropCad by clicking a cell and dragging the highlight to encompass the desired data. Press CTRL+C to copy the data to the clipboard, then paste into Excel. To set the data in PropCad from the clipboard, first we must make sure the desired columns are edittable. 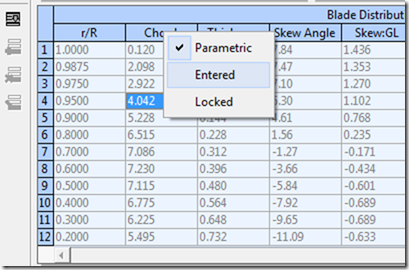 Right click the column header and select "Entered" to enable manual entry in the column. Copy the desired data from Excel, and paste into PropCad using CTRL+V.